Purses Part 4 What the Clues tell us and More about purse forms! So last time we looked at the most common form for a large purse. And I mentioned that the picture of the purse held a very important clue. Take a look at this composite picture. The left most picture shows the typical purse frame, and the right two pictures are of the piece of purse frame that I own. 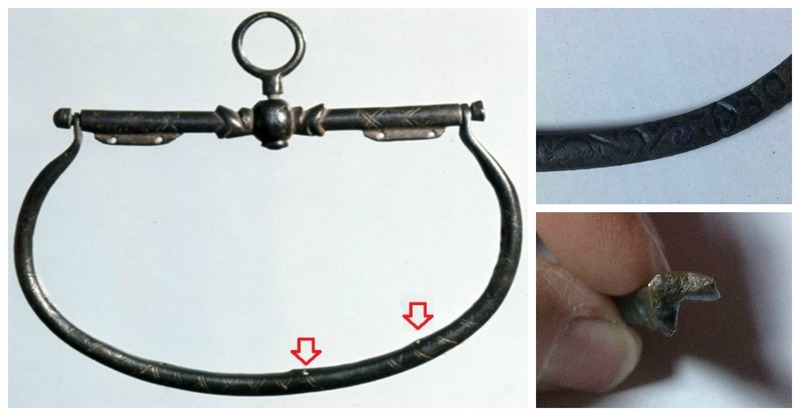 The picture on the top right shows the fragment of purse frame in the same position as the intact purse frame is in on the left hand picture. You can see that this purse frame fragment also has Niello decorations, this time in the form of floral swirls that act as spacers between words. DEO and H are the only visible letters on the frame fragment. The original inscription was probably “DEO HONOR ET GLORIA” – Honor and Glory to God. The use of standard inscriptions was very formulaic in Medieval times, but that is another blog. The picture on the right bottom shows the cross section of the purse frame. As you can see, the frame is NOT flat, but rather L shaped. The back of the L, which doesn’t really show from the outside of the purse unless the frame is bent, is pierced to allow the bag portion of the purse to be attached. The two red arrows show two locations where the purse frame is pierced. I am certain that there are others, but these holes show because the frame is bent. The fragment of purse frame that I own has two holes in the back section of the frame that are 1 3/8 inches apart. Both of these holes are elongated from extreme wear and stress. Most purse frame pieces that we see show extreme wear. The main support bar is often bent and the holes in the frame that were used to support the fabric or leather bag usually show signs of wear. I have seen at least some examples where the top of the fabric bag was actually sewed to, and supported by, a heavy wire, which was then attached to the purse frame with wire loops. These wire loops would have put a considerable amount of point stress on the purse frame, causing both wear and stretching or bending of the purse frame. I would also suspect that purse frames, being an expensive item, were reused until they were totally worn out. It seems as if putting a new cloth or leather bag on a metal purse frame would have been a way to relatively inexpensively update an important accessory. Before we go any further I should give a set of standard terms that I am going to use to describe purses. I have looked at a lot of purse frames in person and in online collections and my terminology aligns with what I see most of the museums using. 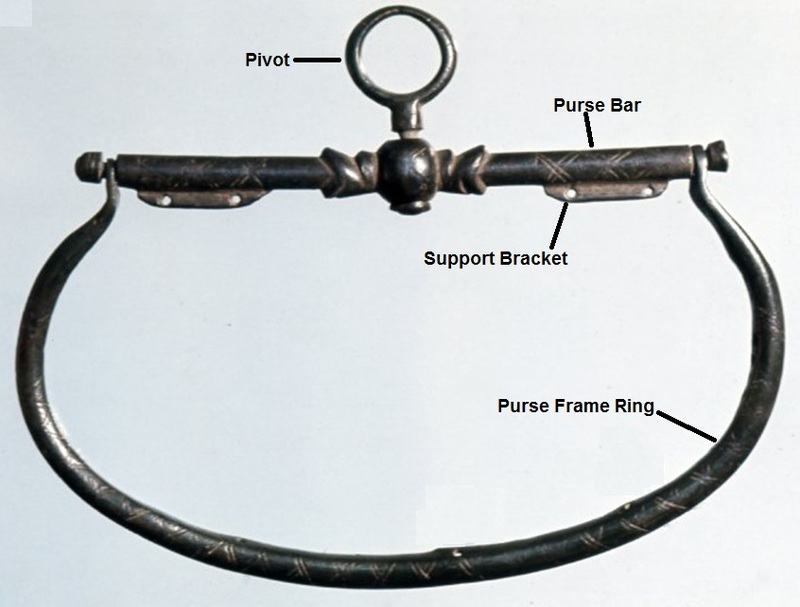 Here is a graphic showing the basic purse frame with terms. It really isn’t that complicated, but having a set of standard terms will make it simpler when we are discussing the basic construction techniques that are used in the more complex purses later. Next Time: What other forms of purse frames do we find? This entry was posted in Dress Accessories, Leather Purse or Belt Pouch With Brass Frame, Metal Casting, Metal Working, SCA Life and tagged Medieval purse, Metal purse frame by Eirny. Bookmark the permalink.